How much do tourbillon watches cost? Tourbillon timepieces are true watchmaking masterpieces. Manufacturers such as Patek Philippe, Audemars Piguet, and A. Lange & Söhne have perfected these precise watches and combine them with impressive complications like perpetual calendars. Tourbillon watches have an incredibly special mechanism that compensates for gravity-related deviations from the correct time. Abraham-Louis Breguet invented the tourbillon ("whirlwind") in 1795. Back then, men carried their pocket watches around vertically in their vest pockets. This position negatively impacted the watches' accuracy, and thus they would often deviate from the reference time. Therefore, Breguet invented a cage that makes an entire 360-degrees rotation every minute and placed the balance wheel and escapement inside the cage. The rotation compensated for the gravity-related deviations and created exceptionally precise mechanical timepieces . Today, watches with a tourbillon are still considered proof of haute horlogerie. These timepieces regularly outperform others in precision tests. Almost all traditional, renowned Swiss manufacturers feature timepieces with a tourbillon in their collections. Brands such as Patek Philippe or Jaeger-LeCoultre add additional complications to their tourbillon watches. These so-called Grande Complication models are the epitome of haute horologie and are some of the most expensive watches in the world. One example of such a watch is Patek Philippe 's Sky Moon Tourbillon, which has displays on both the front and back side of the case. It features additional complications such as a minute repeater, perpetual calendar, and a sidereal time display. Seeing as the Sky Moon Tourbillon costs around 1.5 million euros, it's one of the most expensive wristwatches in the world. 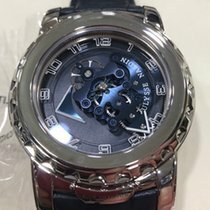 Considering how time consuming and intricate the process is to make a tourbillon, wristwatches with this complication are accordingly expensive. Models from Patek Philippe rarely cost less than 150,000 euros. Wristwatches from the Swiss manufacturers Jaeger-LeCoultre and Audemars Piguet are significantly less expensive, costing 30,000 euros pre-owned and between 50,000 and 60,000 euros new. The most reasonably-priced tourbillon timepieces, however, come from Frédérique Constant. They sell their tourbillon watches for less than 30,000 euros. You can purchase wristwatches from this brand and others in the Chrono24 Brand Boutique. Moritz Grossmann watches are also available in the Brand Boutique; a new, white gold Benu Tourbillon timepiece costs 168,000 euros. Jaeger-LeCoultre, Audemars Piguet, and Breguet are three more brands that are traditional tourbillon watch manufacturers. Breguet, based in L'Abbaye in Switzerland, was founded in 1775. Since the late 1990s, it has been a part of the Swatch Group. The royal houses of Europe and many prominent politicians have historically been loyal Breguet customers. For example, Napoleon Bonaparte and Winston Churchill were two famous Breguet wearers. Prices for pre-owned Breguet timepieces start at 40,000 euros, while new models cost at least 74,000 euros. 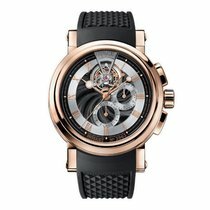 Top models made of 18-karat rose gold with two tourbillons cost around 305,000 euros. The Royal Oak is Audemars Piguet's most famous model. The most renowned watch designer of all time, Gérald Genta, developed this stainless steel timepieces in the early 1970s. Originally, it was conceived as a simple, thin sports watch. Today, it's also available in gold with a tourbillon and other intricate complications. New stainless steel models without any additional functions start at 100,000 euros. You can also find new Royal Oak chronographs with a tourbillon in this price range. Pre-owned chronographs start at around 85,000 euros. Jaeger-LeCoultre, based in Le Sentier, has improved upon the traditional tourbillon so that gravity-related deviations are compensated for in every position. The engineers were able to achieve this by placing the cage in a second cage, making three dimensional rotations possible. A new platinum Reverso Tribute Gyrotourbillon costs around 245,000 euros. Its successor, the rose gold Reverso Gyrotourbillon 2, costs about the same. The white gold Reverso Grande Complication à Triptyque, on the other hand, costs about 100,000 euros more. This complicated timepiece has a perpetual calendar and sky chart, as well as sidereal time and sunrise and sunset displays. The Reverso, which has been on the market since the early 1930s, is JLC's most popular and famous model. Its characteristic features include a rectangular, reversible case that rotates 180 degrees. If you're searching for a tourbillon watch, but don't want to or can't spend hundreds of thousands of euros, you should take a look at wristwatches from Frédérique Constant. Their tourbillon timepieces are available for less than 30,000 euros, a significant price difference. Pre-owned models can even be purchased for less than 20,000 euros. These are very affordable tourbillon watches with in-house calibers . Versions with a stainless steel case and gold bezel cost 32,000 euros new; the price of a gold watch is around 39,000 euros. Somewhat more expensive are the tourbillon watches from Zenith and the International Watch Company (IWC). Zenith's famous El Primero chronograph is available with a tourbillon starting at 35,000 euros pre-owned and 45,000 euros new. 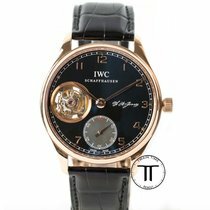 A pre-owned IWC timepiece with a tourbillon costs around 30,000 euros, while new versions still cost less than 40,000 euros. These timepieces are a part of the famous Portugieser collection.